The GRAMMY Museum® has acquired the five-piece DW Drums Collector’s Series®drum kit played during GRAMMY® winner Bruno Mars‘ tribute to the late GRAMMY-winning icon Prince on the 59th GRAMMY Awards® on Feb. 12, 2017 at STAPLES Center. The five-piece set was donated to the Museum’s permanent collection by Oxnard, California-based, drum manufacturers, DW Drums, and is now on display in the Museum’s lobby. Mars and his band, the Hooligans, paid tribute to Prince on the 59th GRAMMYs with a performance of Prince’s 1984 hit “Let’s Go Crazy.” While Mars played a white Schecter Cloud guitar, his brother and drummer, Eric Hernandez, played the gloss white, DW Drums Collector’s Series® kit complete with Prince’s iconic “symbol” hand-painted in gold leaf on the bass drum head which is currently on display at the Museum. The tribute also featured performances of Prince’s “Jungle Love” and “The Bird” by Morris Day and the Time. In conjunction with the display, beginning today through April 19, 2017, fans can enter for the chance to win a stunning, five-piece DW Design Series® drumset, and DW 5000 Series hardware complete with a bass drum head hand-signed by Bruno Mars and his entire band prior to their performance at the 59th GRAMMYs. Registrants may enter to win the DW Drum display in the lobby of the GRAMMY Museum or in the online sweepstakes at www.dwdrums.com/GRAMMYMuseumContest No purchase necessary. The DW Design Series® drumset in white lacquer features 10″, 12″ and 14″ toms, a 22″ bass drum and 7″x14″ snare drum finished in chrome hardware and also includes DW 3000 Series hardware, single pedal and a drum throne. MSRP: $3800.00. Drum Workshop, Inc. is a family-owned American manufacturer of professional drums, pedals and hardware. Many of the world’s top professionals, such as Sheila E., Mick Fleetwood, Neil Peart, Max Weinberg and Dave Grohl have made the DW brand “The Drummer’s Choice.” Drum Workshop is also home to Pacific Drums and Percussion, a full line of production drum and hardware products. For more information, visit www.dwdrums.com or follow @dwdrums on Twitter and Instagram and like DW on Facebook. The GRAMMY Museum is an independent, 501(c)(3) non-profit organization created as a partnership between The Recording Academy and AEG. Paying tribute to music’s rich cultural history, the 21st century Museum explores and celebrates the enduring legacies of all forms of music, the creative process, the art and technology of the recording process, and the history of the premier recognition of excellence in recorded music. The GRAMMY Museum features 30,000 square feet of interactive permanent and traveling exhibits, with four floors of dynamic and engaging multimedia presentations, and is located within L.A. LIVE, the downtown Los Angeles sports, entertainment and residential district. Through thought-provoking and dynamic public and educational programs and exhibits, guests will experience music from a never-before-seen insider perspective that only the GRAMMY Museum can deliver. For more information, please call 213-765-6800 or visitwww.grammymuseum.org. For breaking news and exclusive content, follow @TheGRAMMYMuseum on Twitter andInstagram, and like “The GRAMMY Museum” on Facebook. The GRAMMY Museum is located at 800 West Olympic Boulevard, Suite A245, Los Angeles, CA 90015. With an entrance off of Figueroa Street, the Museum resides within the L.A. LIVE district, at the intersection of Olympic Boulevard and Figueroa Street in downtown Los Angeles. The Museum is open Monday through Friday from 10:30 a.m. to 6:30 p.m., and Saturdayand Sunday from 10 a.m. to 6:30 p.m.
A diverse team of scientists, soldiers and adventurers unites to explore a mythical, uncharted island in the Pacific, as dangerous as it is beautiful. Cut off from everything they know, the team ventures into the domain of the mighty Kong, igniting the ultimate battle between man and nature. As their mission of discovery becomes one of survival, they must fight to escape a primal Eden in which humanity does not belong. KIDS FIRST! Film Critic Arjun N. comments, “Kong: Skull Island is a fun sci-fi movie which is a breathtaking visual treat. I really found the direction and special effects to be fantastic in this movie. This will appeal to all those sci-fi fans.” See his full review below. Kong: Skull Island is a fun sci-fi movie which is a breathtaking visual treat. I really found the direction and special effects to be fantastic in this movie. This will appeal to all those sci-fi fans. This movie is about a diverse group of travelers which includes former British Special Air Service Captain James Conrad (Tom Hiddleston), an anti-war photographer Mason Weaver (Brie Larson), a government agent Bill Randa (John Goodman), a seismologist Houston Brooks (Corey Hawkins), and an army led by Preston Packard (Samuel L. Jackson) who head to Skull Island. Upon arriving, they are attacked by Kong, a huge gorilla, who destroys their helicopters and splits the team up. Packard wants revenge for the men he lost in the helicopter crashes and he wants to kill Kong. Conrad and Weaver realize a bigger threat known as the Skullcrawlers lurk beneath them. The only one who can protect them is Kong and only he can ensure the team’s safety in escaping the island. Tom Hiddleston as James Conrad heroically represents a soldier. Brie Larson as Mason Weaver is very impressive as a bold photographer. John C Reilly as Hank Marlow, a war veteran, is my favorite character in the movie due to his comic relief and interesting backstory. Samuel L Jackson as Preston Packard brilliantly expresses his revenge with his angry facial expressions. The direction of the movie by Jordan Vogt-Roberts is unique and really captures the vibe of the 1970s. His filmmaking emphasizes on the smaller things more than the big things, and this is an interesting new concept. This is primarily used whenever we see Kong especially in the first Kong encounter. 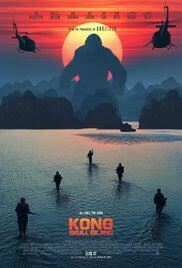 The focus is more on Kong’s face than just his whole body, and this adds tension. Also, the special effects by Chris Brenczewski really add detail to the monsters, and makes them look real. The scene that I liked the most is the final fight scene between Kong and a big Skullcrawler. It is absolutely a blast and, the fact that it is a hand to hand combat scene made it particularly fun to watch. My only problem with the film is the characterization. While all the talent gives pretty believable performances, somehow their characters feel like bland stereotypes. I didn’t find myself caring for anyone other than John C. Reily’s character who has some interesting story beats. The movie’s message is to not mess with nature because if these travelers didn’t attack Kong’s territory, then he wouldn’t have attacked them in the first place. I give this movie 4 out of 5 stars and recommend it for ages 11 to 18 years. It may be too scary for younger audiences due to the intense action and language. This film opens in theaters on March 10th, so go and check it out. Did you know that today is National Pack Your Lunch Day? Whether it’s for your little ones, other half or just you, these Honey BBQ Tuna Sliders are delicious, different and have 29 grams of protein! All that fuel will keep you going all day! Here’s a recipe from our friends at StarKist! Credit: StarKist. No compensation was received. I participated in the “How Do You Granola?” Challenge! Who doesn’t love granola as a delicious and nutritious snack? Whether adding to yogurt, creating homemade granola bars or incorporating into your favorite dessert, there are numerous ways to enjoy this super food. So, when Viki’s Granola asked me if I wanted to participate in the “How Do You Granola” Challenge..Well, I just had to accept! I received a bag of the Viki’s Granola in Maple Cranberry and Banana Walnut. I was at first thought…going to come up with a granola bar but I then thought that I would go with something much more simple! 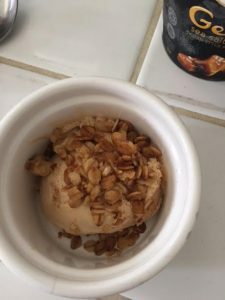 So, I chose Salted Caramel Gelato and simply added the yummy granola on top! It was delicious and it doesn’t get any easier than that! 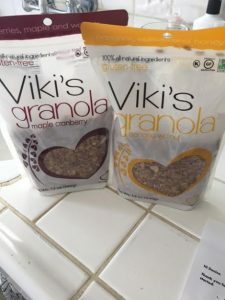 Self Disclosure: I received free samples of Viki’s Granola to participate in this fun challenge. No other compensation was received. Pet product called “Love Your Laptime” is a Must-Have! Looking for something that your pet and you will both love? 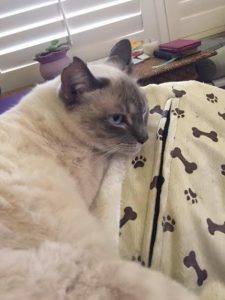 Do you have a cat (or dog..or even Rabbit) who likes to sit or lay in your lap? 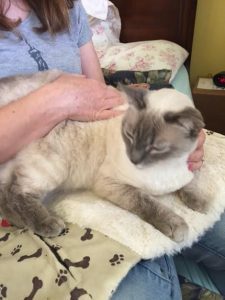 The innovative pet product called “Love Your Laptime” is a product that you will love! 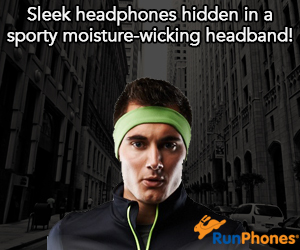 It is made out of plush fabric and it is washable! You simply place it in your lap and it is comfy for both owner and pet. 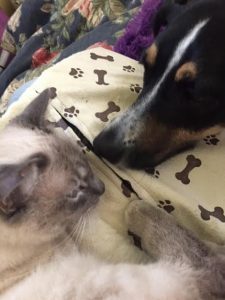 My cat Snowball jumped on it right away and my Pup Bink decided he would rest on it too! It also has a zipper closed pocket to store grooming tools and or treats. Now, how cool is that? My pets think the treats are pretty cool! To find out more and to purchase go to www.myfavoritefurr.com. Self Disclosure: I received a free sample to facilitate this Pet Corner post. No compensation was received. Looking for a wonderful Picture Book for young children? 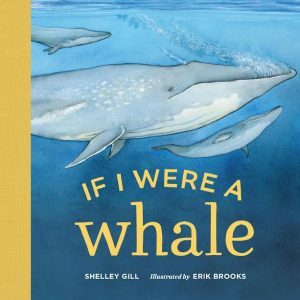 If I Were A Whale by Shelley Gill is a must-read! This is an adorable book with wonderful illustrations! Perfect for ages 2-5. ~SoCal City Kids. Looking for a great book for young adult or older adult? This next one is a must-buy! This is not your ordinary coloring book! 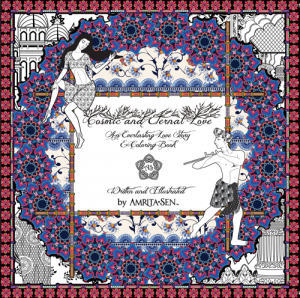 It is a story about an amazing Indian Love story with incredible detailed drawings that you can color! I just love the details! The book also includes a musical CD featuring songs by the artist herself which compliment the classic story. You can purchase on B&N or on Amazon.com. The Amrita Sen line of stationary products also includes a notebook, agenda, sticky notes and a companion box of colored pencils. All items are available at Barnes & Noble and Dillard’s. This next one is a must-read for all Moms! A bedside project to keep her ailing mother engaged leads an author/editor to a thoughtful collection of stories involving more than three dozen sons and daughters with unforgettable life lessons, tailored to modern day attention spans. Some submissions grappled with second chances and the work that derives from repair; touching on topics like acceptance, love, and redemption. One contributor reflects on her mother as “The General,” and talks about the strain of growing up, only to turn the page, become a parent herself, then call her mom not out of obligation but out of desire. Others talk about resilience in spite of mounting personal challenges, like starting over in a new country, while clinging tightly to old ways of life. One daughter describes cutting her hair in an act of defiance – a monumental victory – until later she wins the fight against her dad to attend college and live on campus, making the earlier battle seem comparatively insignificant. 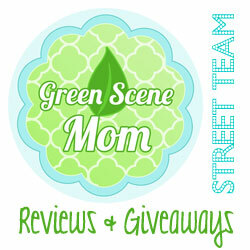 Many contributors shared examples of what they liked about their moms. Top of the list: walking the walk, finding unexpected strength, and the ability to evolve over time. Then there were others who focused on how their moms actions taught them what not to do. The daughter of a glamorous, highly-prestigious, Madison Avenue copywriter, learned through her mother’s low self-esteem not to focus on weakness but to embrace her strengths. Not surprisingly, in many stories where contributors shared a negative lesson, they showed great compassion and respect toward their mothers. 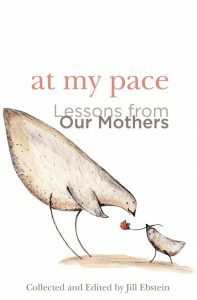 AT MY PACE: LESSONS FROM OUR MOTHERS is a celebration of the matriarchs in our lives. Full of insight and introspective tales, the book highlights the love between parent and child. The mission of the editor is to add meaning and understanding to one’s life by candidly sharing life experiences and provide ample opportunities for self-reflection, at one’s own pace. I really enjoyed reading this one and highly recommend for Moms and Daughters too! Jill Ebstein is the editor of the At My Pace series of books – At My Pace: Lessons from Our Mothers (Nov, 2016) and At My Pace: Ordinary Women Tell Extraordinary Stories (2015). She’s the founder of Sized Right Marketing, a Newton, Mass., based consulting firm that helps Fortune 500 companies use the customer voice to develop workable strategies that will yield results. She holds a BS from Washington University and an MBA from Wharton. Learn more at: http://www.atmypacebook.com. I love this next one! 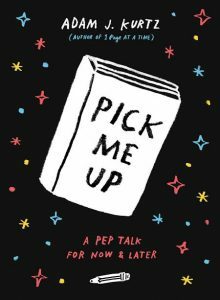 THE Perfect Gift Guide Creativity Title – Bestselling Designer Adam J. Kurtz’s PICK ME UP! This one is a must for everyone! I would recommend it especially for Teens and adults! It will definitely cheer you up when things seem bleak and I love this DIY type of book! It’s different and maybe a bit strange but it is an optimistic book that will help with positive change! Adam J. Kurtz is a Brooklyn-based artist and author whose first book, 1 PAGE AT A TIME: A Daily Creative Companion has been translated into fifteen languages. In addition to personal work, he’s collaborated on products for retailers such as Urban Outfitters, Strand Bookstore, and Fishs Eddy, and made work for companies including Pepsi, Adobe and the New York Times. In 2016, he was named one of PRINT Magazine’s “15 Under 30” New Visual Artists. The next one is great for the Kids who want to learn Scratch Coding! The latest release from No Starch Press, the market leader in kids programming books, offers an exciting new way to learn to code. The Scratch Coding Cards ($24.95, 75 laminated cards, December 2016) are a colorful collection of activities that introduce children to creative coding. The illustrated activity cards provide a playful entry point into Scratch, the graphical programming language used by millions of children and teens around the world. The deck of cards makes it easy for kids to learn how to create a variety of interactive projects that connect to their interests. They can create a racing game, animate an interactive story, design a virtual pet, and more! Each card features step-by-step instructions for beginners to start coding. The front of the card shows an activity kids can do with Scratch—such as animating a character or keeping score in a game. The back shows how to snap together blocks of code to make the projects come to life. Along the way, kids learn key coding concepts, such as sequencing, conditionals, and variables. This collection of coding activity cards is perfect for sharing among small groups in homes, schools, and after-school programs. The Scratch Coding Cards are available in bookstores everywhere! I like how simple these are and that kids will love to learn with them! ~SoCal City Kids. The Scratch Coding Cards were created by Natalie Rusk. Rusk is one of the lead developers of Scratch and works as a research scientist in the Lifelong Kindergarten Group at the MIT Media Lab. Rusk co-founded The Computer Clubhouse, an international network of after-school centers where young people learn to use new technologies to express themselves creatively. Self Disclosure: I received copies of the above books to facilitate this featured book post. Photos and other information was provided. 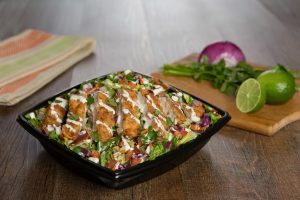 For a limited time this spring, The Habit Restaurants, Inc. (Nasdaq: HABT) is introducing a Golden Chicken Salad nationwide. I just love this new Golden Chicken Salad! I had the opportunity to try it out this week and I love the chicken and the dressing! I highly recommend! This is definitely a salad I will want to eat again!~ SoCal City Kids. Self Disclosure: I received a gift card to review the New Golden Chicken Salad. Photo and information was also provided.